Hildagard Adalena Martel Powell, daughter of Henry P. Martel and Pauline Krein, married to John William Powell and buried in Buffalo Gap Cemetery, Buffalo Gap, Taylor County, Texas. 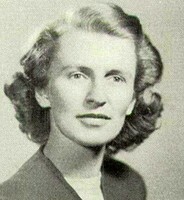 South Taylor County Independent School District Grade School Teacher (1956-1957). First Jim Ned Consolidated Independent School District Sixth Grade-A Teacher (1957-1975).